A few weeks ago, I wrote about the Hopsy SUB Compact, and I’ve been testing it for the last week. 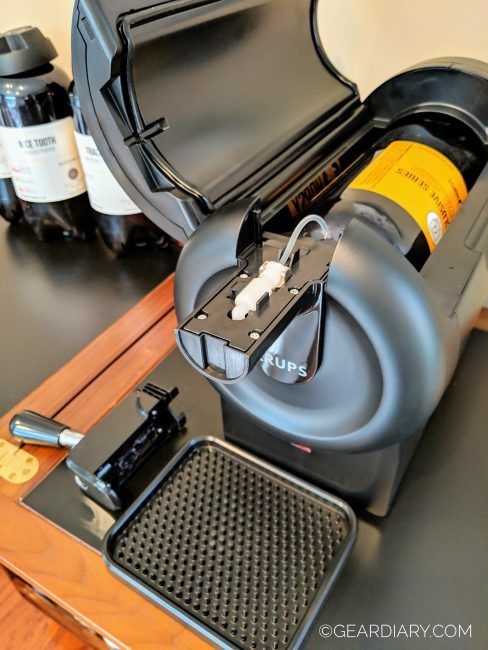 The SUB Compact is a beautiful and functional device that will be an excellent addition to any home bar as long as you have patience and can deal with the noise of the cooling fan. The SUB Compact arrived in a large cardboard box which contained both the actual device and four mini-kegs of different flavors each containing 67.6oz of quality beer. One thing to note right off the bat is that this SUB Compact can only be used with these specific mini-kegs which Hopsy kindly provides through their service. Part of the reason for this is actually the way the SUB Compact has been designed to accommodate this specific size with pressure points and sensors to match. After removing the contents of the large box, you’re left with the four mini-kegs and the actual SUB Compact which is made by KRUPS. There was also a welcome pamphlet from Hopsy with some quick instructions, information about the beers they provide, a handy beer tasting checklist as well as information about how to share your experience on social media with the right hashtags (perhaps the most important information these days). 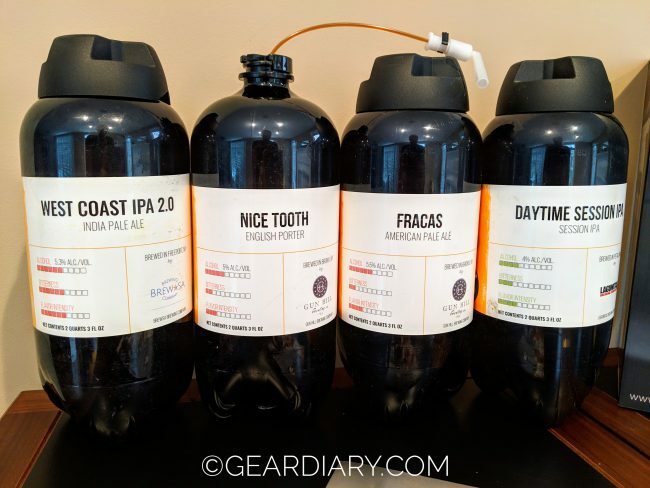 The four specific beers that Hopsy sent were a West Coast IPA 2.0 (India Pale Ale), a Nice Tooth (English Porter), Fracas (American Pale Ale) and Daytime Session IPA (Session IPA). One of the things I loved is the very easy to read and clear labels on the outside of the mini-kegs which showed how the beer stacked up in three different areas; alcohol content, bitterness, and flavor intensity. This is especially handy when you’re starting out and trying to figure out which beers you like but also can help you discover other beers based on the type of beers you like. I honestly wish all beers and wines had this kind of customer friendly labeling on the outside; it would make things so much easier when selecting what to drink. Note the Nice Tooth in the picture above lost its plastic cap in shipping, it was broken when I opened the box, but thankfully there was no spillage in the box or after I took it out. Hopsy offers a pretty wide selection of beers to choose from which usually cost about $19-21 per min-keg. 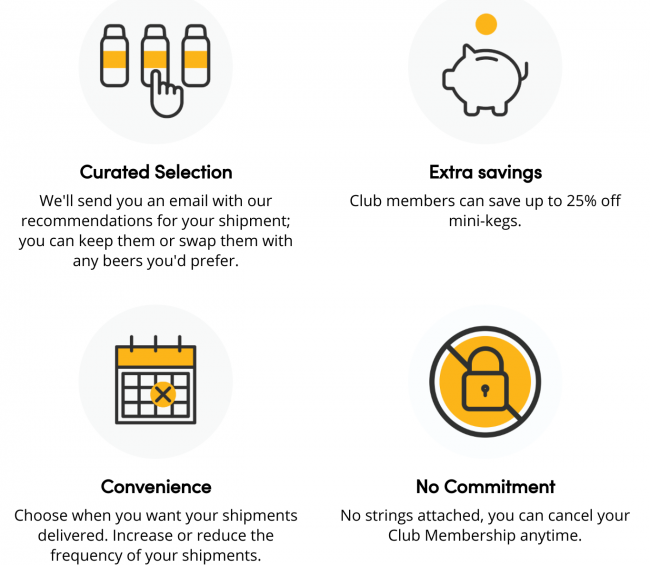 However, they also have a subscription service called The Club which will send you mini-kegs on some frequency to your door and brings the cost per mini-keg down to anywhere from $14-17 on average. This latter option seems better suited for people who want to try different beers as Hopsy will help with curating the selection of beers to your tastes. 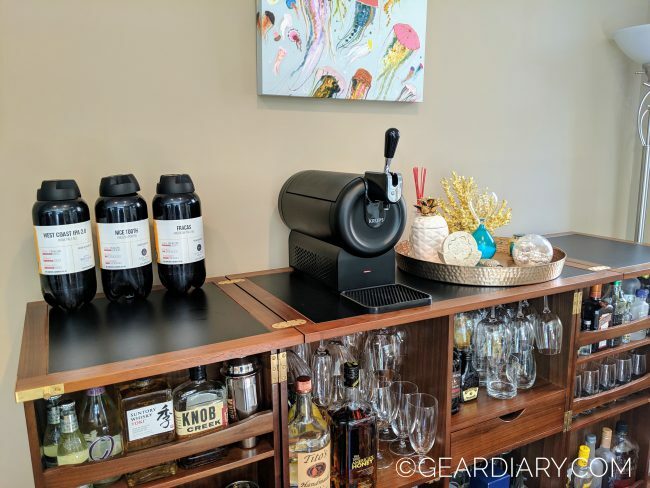 You can change the frequency of deliveries and cancel at any time, which means you could start with The Club for discovery, and once you’ve found a beer or a few you like you could switch to purchasing individual mini-kegs instead as an example. For comparison, an average six-pack of beer is usually around $10 and altogether contains 72oz, if you’re buying 12oz cans, while a mini-keg can be $14-21 for around 68oz (assuming you’re using The Club cheaper prices). So, in general, you are paying more for the beer than if you went to the local store, but the difference may not be so great if you use The Club membership and Hopsy gives you access to craft beers that you may not readily find locally. In the end, it seems reasonable, especially if you use The Club membership but of course, if Hopsy brought their prices down then it would be an absolute no brainer. The process of installing the SUB Compact is very simple. You have to put the spill tray under the spout and snap the handle in. That’s all that comes in the box as the SUB Compact is otherwise fully assembled. Then all that’s left to do is plug in the cord to a standard outlet and you’re ready to insert the mini-keg. However, before I could even get to that, I was greeted with something that I was not expecting and that proved to be a little jarring. 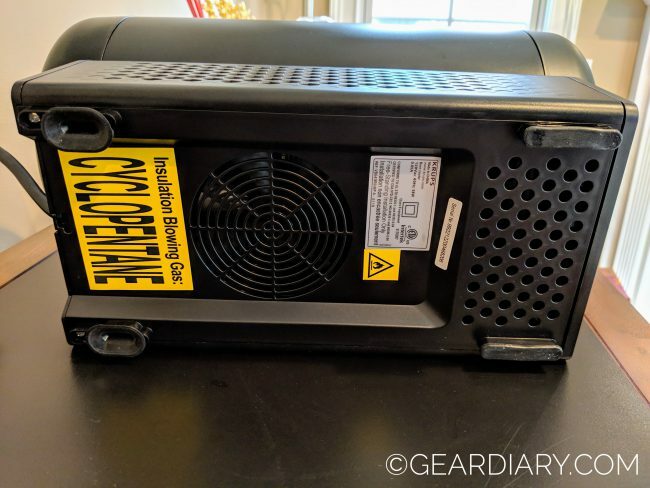 See the SUB Compact will make sure your beer is chilled to the right temperature, but in order to do that, it has to run a rather large looking coolant fan in the bottom of the device. There is a little light on the front of the device that will turn green when the right temperature has been reached. The back of the SUB Compact has suction feet and the front has raised feet to make sure there is clearance for the fan. The problem is this fan is rather loud. As you can hear in the video below, it’s not something that is barely noticable, so unless you have a dedicated bar area that is separate from the rest of your house (which I don’t) get ready to hear the fan noise on a regular basis. 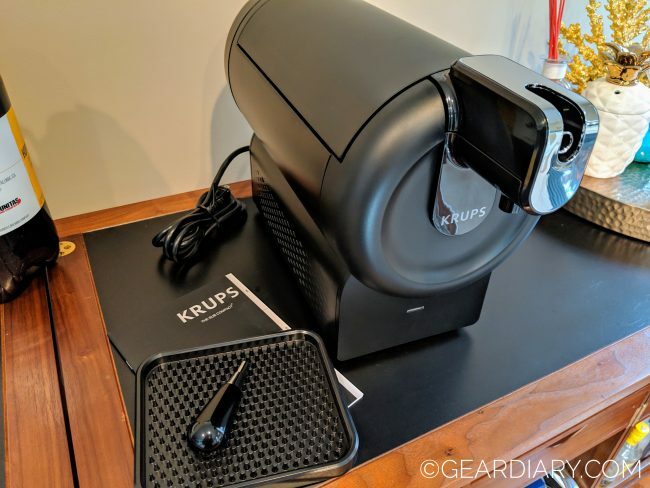 At first, I didn’t think much of this but after reading the manual, it seems the SUB Compact will take up to almost 12 hours to cool a mini-keg to the right temperature — assuming both the beer and device start at room temperature. Based on the laws of physics, that is understandable given what the SUB Compact is working with, but it’s not the best user experience. I can imagine people may insert a mini-keg to the device prior to a party, but unless they did it almost a day before they would be forced to serve warm beer. The manual says not to put the mini-kegs in the freezer to avoid damage from freezing, but I assume if you put the mini-kegs in a regular fridge it might reduce the time needed to get the beer to the right temperature. Still, these mini-kegs are rather big, and I think you’d be hard pressed to find space for even one of them in your fridge unless you had nothing else in there. Fortunately, this should really only be an issue when you swap out a mini-keg for a new one that’s been sitting out, and you have the advantage that the SUB Compact is probably cooler than room temp already so the cooling time should be shorter. Still, this does sadly mean to get the most of the SUB Compact if you like chilled beer (who doesn’t? ), you will need to make sure you plan ahead. Also, the only indicator that the beer is ready is the lone light on the front of the device, so unless you plan on staring at it nonstop it’s something you’re more likely to come back to after many hours to check. I’m not a fan of “connect all the things to the internet” but this is crying out for that. Something as simple as a mobile notification when the beer was chilled and a way to see the beer temperature would make for a much better user experience. As it is, it’s purely a binary status – either the beer is ready, or it’s not. When the light finally turns green, the fan (thankfully) is less noisy as it’s just maintaining the temperature, but it is still audible and most people will notice it. Hopsy claims the SUB Compact will keep your beer chilled and drinkable in this state for 15 days, which should be plenty of time for even occasional beer drinkers to finish a mini-keg. When it comes to inserting the mini-keg into the SUB Compact, it was slightly difficult, but that can be attributed to it being the first time I’ve had to do it; I feel like it’ll be pretty simple in the future. The key thing I struggled with is you have to apply a decent amount of pressure to push the min-keg back into the spring on the backside before then inserting the front of the mini-keg down in the front. I do think once you’ve done this a few times it will become second nature, and there is a very satisfying click that everyone loves when you get the installation done. Once the mini-keg is in, you just have to take the plastic piping and spout and clip it into the tap and you are done. After the beer is finally chilled to the right temperature, the SUB Compact light on the front turns a pleasant green for go or maybe it’s in honor of St. Patrick’s Day. Either way, using it is as simple as can be. Simply hold your empty glass at a 45-degree angle and pull down on the handle until you’re near the top then let go. The beer looks like you just had it poured at your local bar and it tastes as I would have expected it to in terms of temperature and the head. Regarding the taste of the beer: that is extremely subjective, and I’m far from a beer connoisseur, but the point is the SUB Compact should work well as a delivery mechanism for your beer of choice. The Hopsy SUB Compact retails for $299, and it is available right now; you should also make sure to check their offers for current deals.